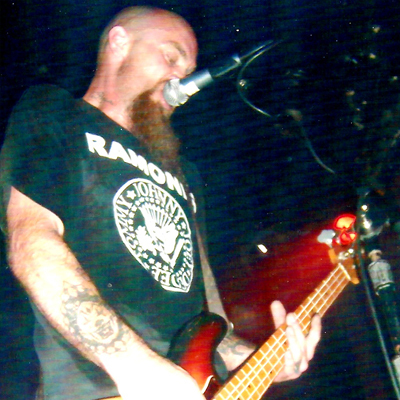 Mondo Generator – heavy stoner-punk rock founded by Nick Oliveri which reunited him with former Kyuss bandmates Josh Homme and Brant Bjork. Oliveri’s screaming vocals, incriminating lyrics, aggressive bass style and stage presence combined with a cast of world class musicians made the band an instant cult favorite. The debut album, “Cocaine Rodeo” recorded in ’97 (released in 2000) was embraced by stoner rock fans across the globe. 2003, “A Drug Problem That Never Existed” featured Homme, Bjork, Mark lanegan, Troy Van Leeuwen, Dave Catching and was released on Mike Patton’s Ipecac Records and Josh Homme’s Rekords Rekords label. “Demolition Day” followed, and then an EP featuring Catching, McGuire and drummer Alfredo Hernandez. 2005 the lineup changed again and he enlisted Winnebego Deal’s Ben Perrier and Ben Thomas. They recorded “Dead Planet” at Grohl’s Studio 606 and picked up the nickname Winnegego Generator. The 2010 release, “Time To Destroy” featured Dave Grohl on the track “Dog Food”. Nick recorded “Hell Comes to Your Heart” at Homme’s studio and rejoins John Garcia and Homme on the track, “The Last Train”. Hernandez was followed by Hoss Wright on drums. Current lineup features Mike Pygmie on guitar and Jeff Bowman on drums.